It seems logical to use short answer quiz slides, in Survey mode, for this use case. However I prefer to use one of the Learning Interactions, ‘Scolling Text’ for reasons I want to explain in this article, by describing both workflows with their specificities. It is up to you to decide which you’ll use. 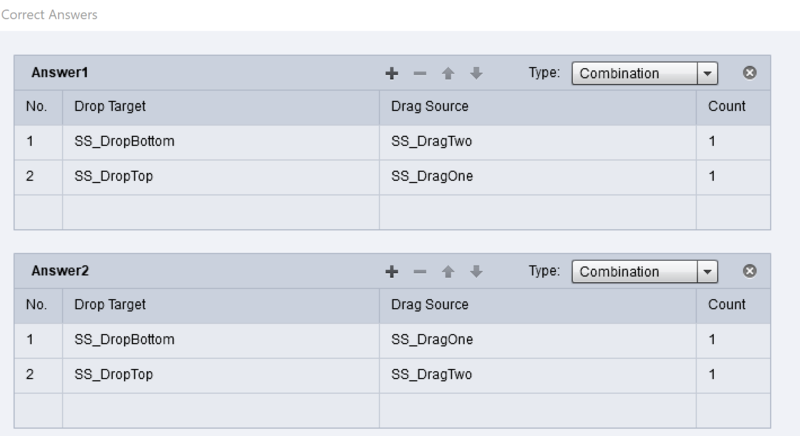 In both workflows variables will be important, hope you are familiar with them. No right/wrong answer means that scoring has no sense, change the stqtus of the quiz slide to ‘Survey’. Nevertheless a score slide will be inserted but you can hide it easily. 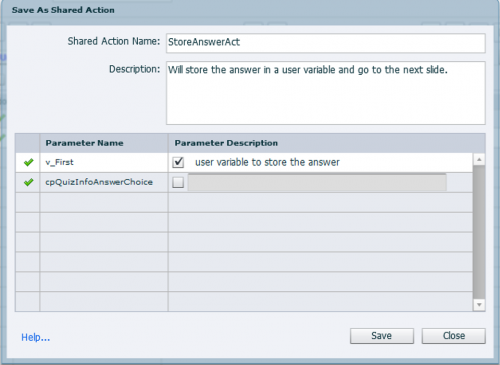 apply this shared action to each of the question slides, with the appropriate parameter. In the example movie I created one text container (shape or caption) and inserted the three user variables in it. 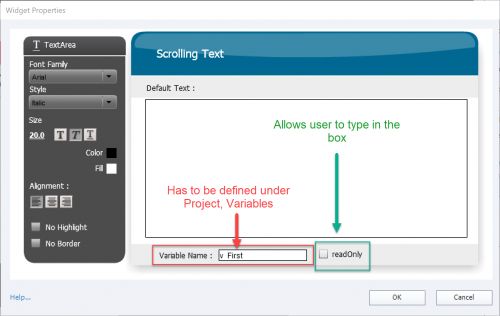 Be careful to increase the number of characters to be shown when inserting the variables. You’ll also have to leave enough space for each variable. Of course you could create multiple text containers and/or have the answers distributed over multiple slides. A limitation of Short Answer quiz slide is that you can have only one answer per slide. When using a Scrolling Text interaction you can have several question on a slide as you can see in the example movie. You have to type in the name of the variable to be used. There is no way to use a dropdown list. Beware: you have to create the variable, it is not created uatomatically. To allow text to be typed in by the user, the checkbox ‘ReadOnly’ has to be unchecked. By default it is checked. It would have been possible to enter the question in the interaction, instead of having it in a separate text container. I preferred not to do it. Reason: if the user adds the answer, instead of overwriting the question, the variable will contain html tags, like <br>. The Submit button, which you’ll see on the slide, triggers the (default) action ‘Go to Next Slide’. 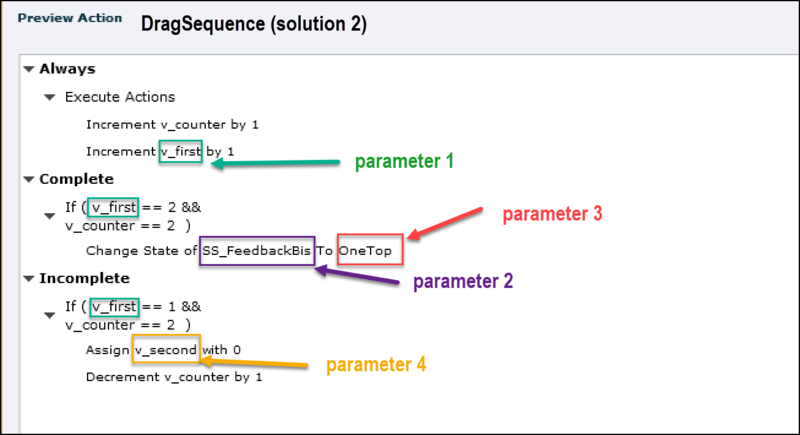 Very easy: duplicate the slide with the interactions, and take out the On Enter action to reset the variables. The interactions are now populated with the given answers. Moreover the learner can still edit those answers, because of the option ‘ReadOnly’ being unchecked. If you don’t want it, check the option ‘ReadOnly’ on this duplicate slide. It is also possible to use a similar slide for the first workflow with short answer quiz slides. That will be useful if you want indeed to allow editing the answers. After the introduction to Micro-Navigation I explained how to use it for forcing the first view of a slide, and for playing an audio file on first visit. When looking at the resulting advanced actions they are pretty similar in both posts. Moreover you probably will want to use the action on multiple slides in the course, and maybe also in future courses. That sounds like a perfect scenario for conversion of the action to a Shared action. I have been blogging already several times about Shared actions. 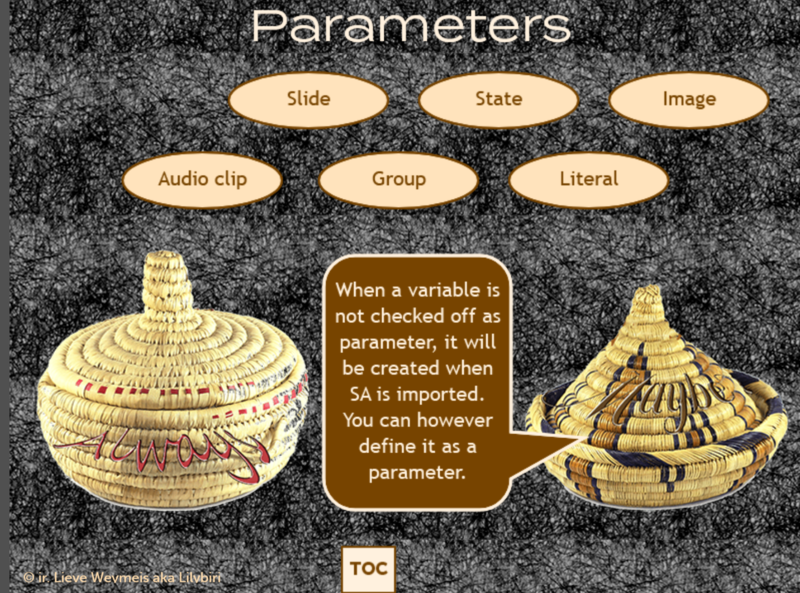 In the present article I try to explain how to reflect on the use of parameters. Static objects need to be parameters as are states and groups, I label them as 'compulsory'. But Variables and Literals are 'candidate parameters', a well-founded choice for change them in parameters, can save you lot of time later on. Consider it a good practice example. When comparing the two advanced actions created in the mentioned articles, there is a small difference: the first decision (which is a standard action) has one command extra in the second advanced action (for Audio). For the ForceAct, the number of seconds to be jumped over is directly entered in the Expression command, for the SkipSlideAudio, Assign is used to store the number of seconds in the user variable v_skip. Both versions work well, but personally for a shared action I prefer the one with the extra Assign command. What are the parameters for the shared action? 'Assign v_skip with 16.5': this first command has two candidate parameters, the variable v_skip and the literal 16.5. The variable can be reused on each slide where the action is needed. Both advanced actions used the same variable in the interactive movie. There is no need to promote that variable to a parameter in that case. However the literal '16.5' is the number of seconds to be jumped, will have a unique value on each slide, it has to be promoted to a parameter. 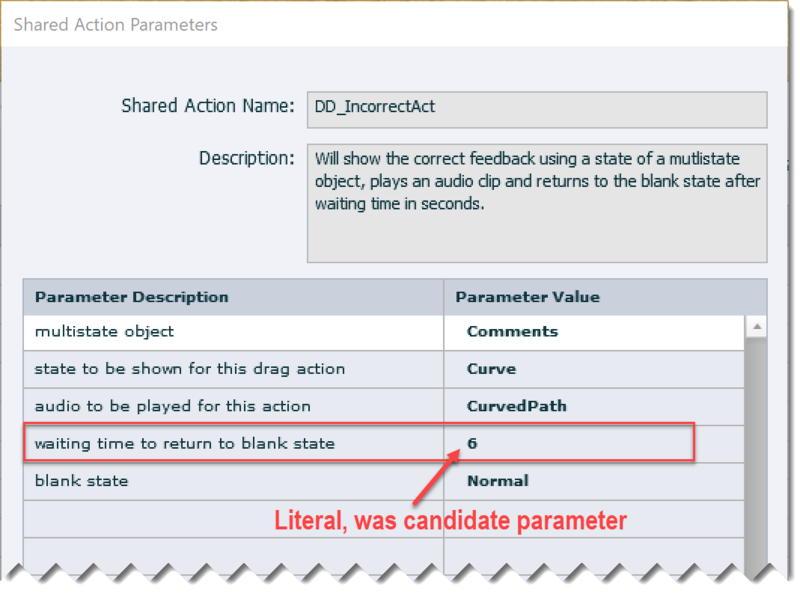 Parameter 1 = literal. You have to be careful with literals: double-check that the same numerical value is not used anywhere else in the action. In this example there is a second literal '1' in the second decision, Increment command. It has to be different from the first parameter, which is the case. 'Expression v_skip = v_skip * cpInfoFPS': the user variable v_skip is no parameter (see above). The system variable cpInfoFPS has never to be replaced by another variable, will be no parameter neither. 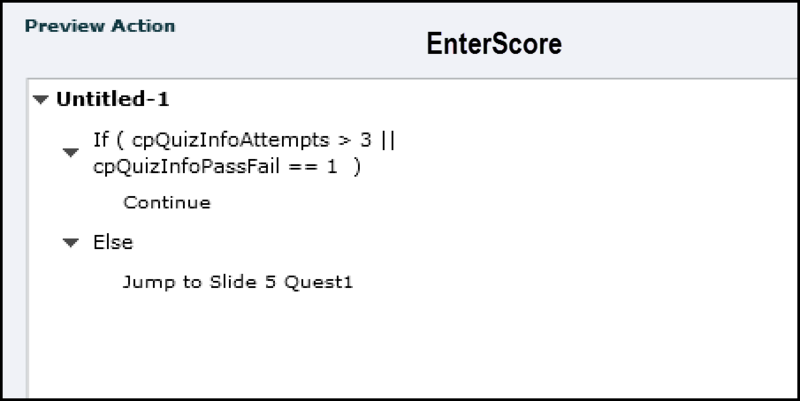 'Increment v_visit by 1': the user variable v_visit has to be unique for each slide, as you can see in the action SkipSlideAufio where another variable has been used. 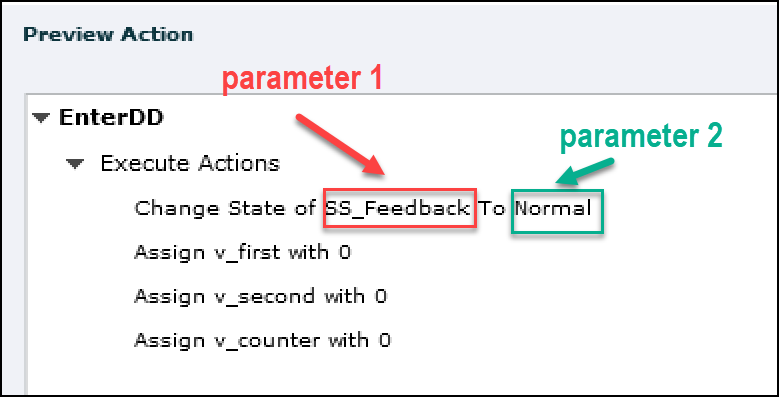 This means that we have to promote that variable to a parameter, parameter 2. The literal '1' however will always be the same, no need to turn it into a parameter. We already double-checked that the literal in the first decision was different from 1. 'IF v_visit is greater than 1': has two candidate parameters as well. We already indicated that v_visit is a parameter. The literal in this case will always be 1, will never be changed and need not to be a parameter. 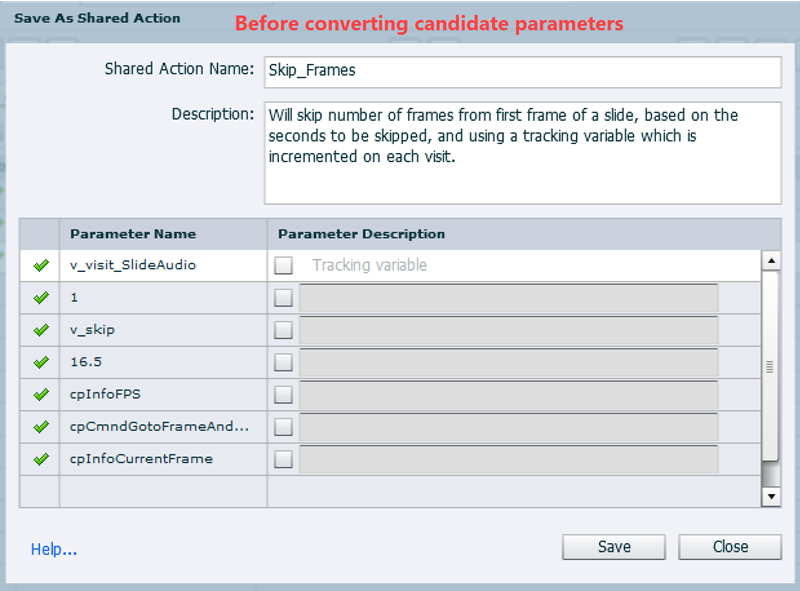 'Expression cpCmndGotoFrameAnd Resume = cpInfoCurrentFrame + v_skip': has 3 candidate parameters. Above was already decided that v_skip can be reused on each slide, and the system variables will always be the same. You can check in the Library for the Usage of the Shared action, much easier than for advanced actions. Use File, Import, External Library and point to the project where you created the shared action. Library will be opened in a floating panel. Look for 'Skip_Frames' in the Shared Actions subfolder and drag it to the Library of the new project. 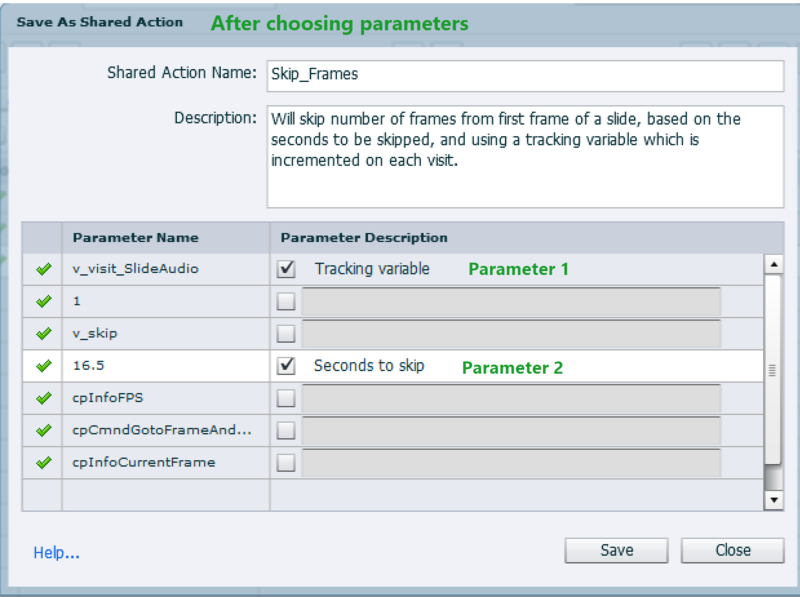 Because v_skip is not a parameter in the shared action, it will be created automatically, including the description. You have to create a tracking variable for each slide to which you want to assign the shared action, and define the duration in seconds to be skipped. Ready! "I'd like to customize the results page at the end of a quiz to display the numbers 1 to 20 (representing the 20 questions in the quiz) and indicate if each question was answered correctly or incorrectly." 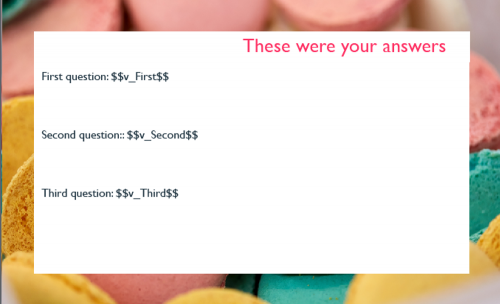 To show the user an overview of answers on a test with Knowledge Check slides: which anwsers were correct/incorrect? 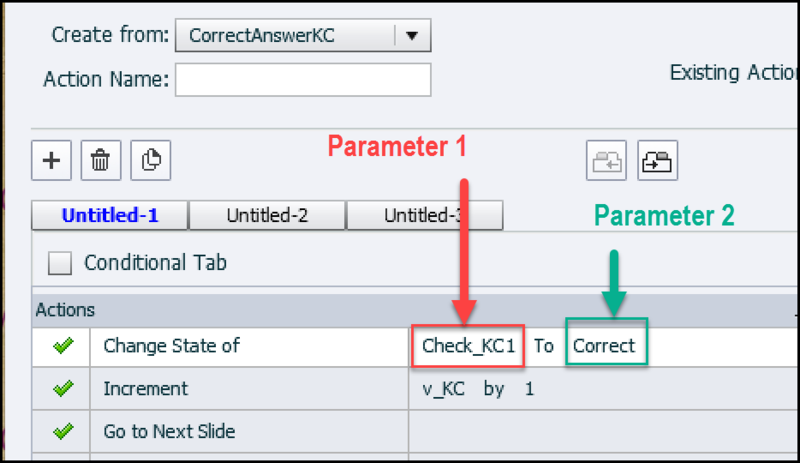 If you are not sure about the differences between KC slides and normal quiz slides, have a look at this article. To create a Review slide, where the learner would see the same information for normal quiz slides. 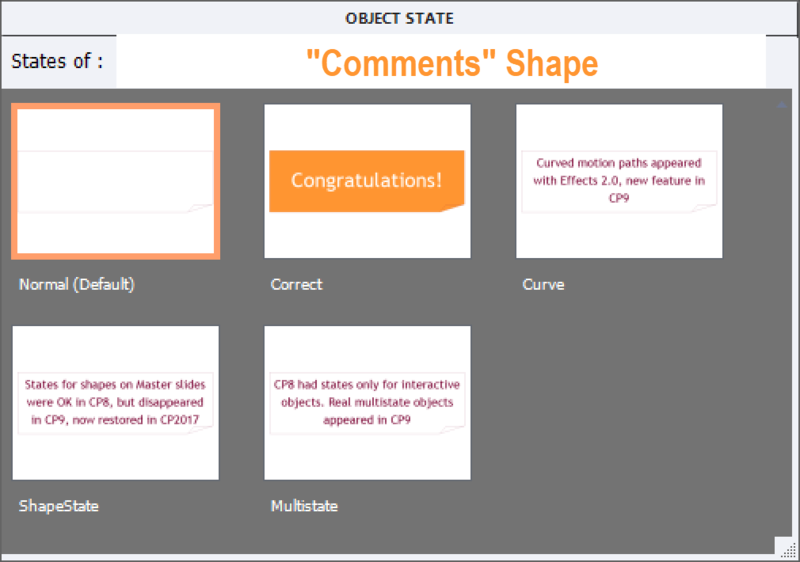 Captivate has a great Review feature for quiz slides (not for KC slides) but it has some shortcomings. It will not only show the answers by the learner but also the correct answers. Moreover, clicking the Review button will cancel all remaining attempts on Quiz level for apparent reasons. With the solution I propose the user would not see the correct answers, only which questions were answered correctly or incorrectly, and the Retake attempts would still be available. 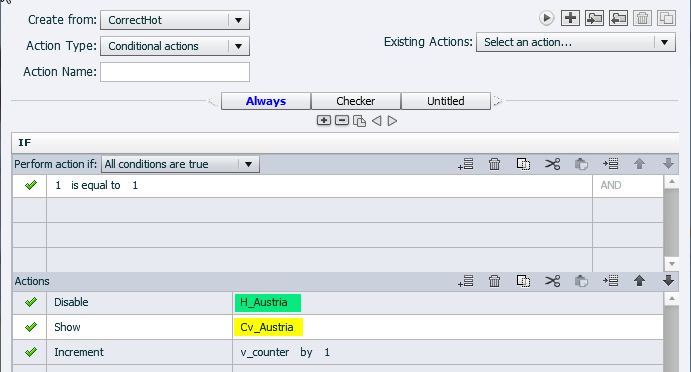 The work flow is based on a couple of simple shared actions, use of multistate objects (for the feedback checkmarks) and some advanced actions. Watch this embedded movie or use any device to open this link (it is a rescalable, non-responsive HTML5 project). You will first see a test with two Knowledge Check slides, followed by a 'Review' slide. You will be able to retake this test, or to continue. Second part is a realy quiz, with 5 question slides. Question slides are followed by a Review slide. In Quiz Preferences I provided 3 attempts. When the attempts are exhausted or you succeeded passing the test, the Next button (was formerly a Retake button) will take you to the official Score slide. Normal state: shape is invisible because Alpha for Fill and Stroke for Width are both set to 0. Correct state: shape is filled with a PNG representing a green tick symbol. This can of course be all you want: text, text + image, text + image + audio. I kept it simple. Wrong state: shape is filled with a PNG that is the Cross symbol. The checkmarks are labeled: Check_KC1 - Check_KC2 for the KC slides, and Check_1, Check_2.... Check_5 for the Quiz slides. The numbers make it easier to select them by filtering in the Parameters dialog box, because they are used in the shared actions. That button on the Review slide for the Quiz, is used to start a new attempt because the user will not see the Score slide. I had to reproduce he functionality of that Score slide, where the Retake button automatically disappears in two situations: either the learner has passed the quiz, or the Quiz attempts are exhausted. I solved that by adding a custom state to the Retake button, where the label changes to 'Next'. To have a non-confusing Rollover and Down state, which would be valid for both the Retake and Next button, I used the text '>>'. 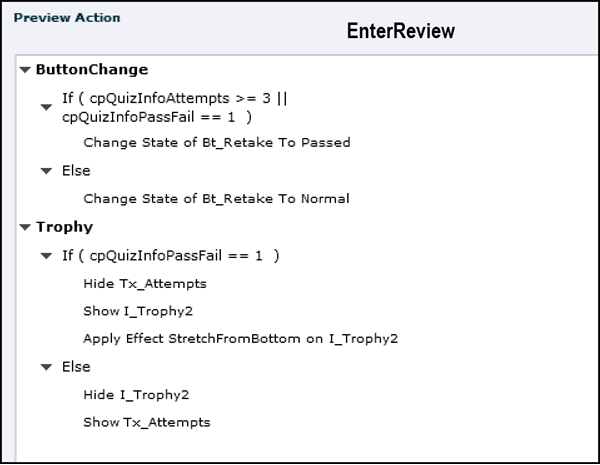 This is the Object state panel of this button, type Transparent button like the Quiz buttons and buttons on the Score slide: The advanced action (see below) EnterReview will take care of switchnng beteen the Normal and Passed state. The Review slide for the KC questions doesn't need that type of button. It has two buttons: Retake for those who want to retry the KC test (answers are always reset for KC slides when leaving them) and a Continue button. I changed the default setup to only one attempt for the KC-slides (default = Infinite attempts). That change made the Last Attempt event availalbe. Contrary to Quiz slides the results of the KC-slides are not stored in exposed system variable. 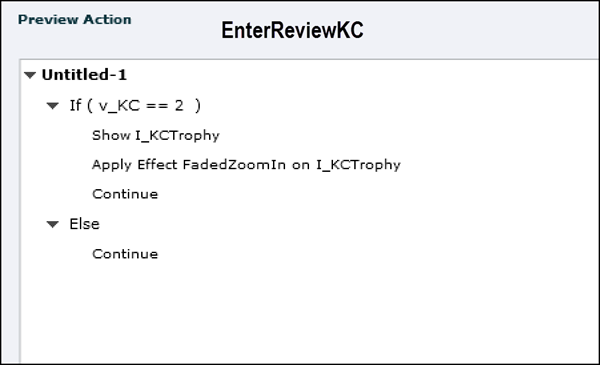 I wanted to show a 'trophy' on the Review slide to learners who correctly anwered all KC-questions. To track the correct answers, I created a user variable, labeled v_KC which starts with a default value of 0 and is incremented for each correct answer. For the same reason, the shared action triggered by the Success event is different from the one used for normal quiz slides. 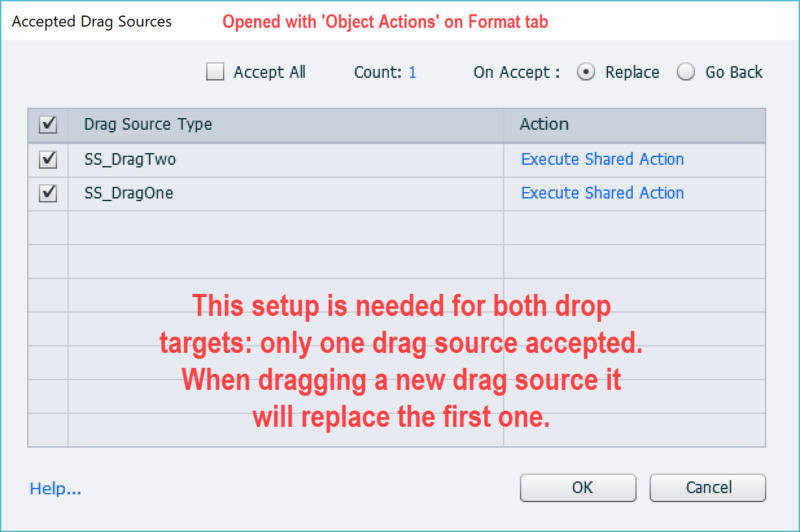 If you import the shared action to another project, the variable will automatically be created. Quiz slides kept the default setup: only one attempt allowed. 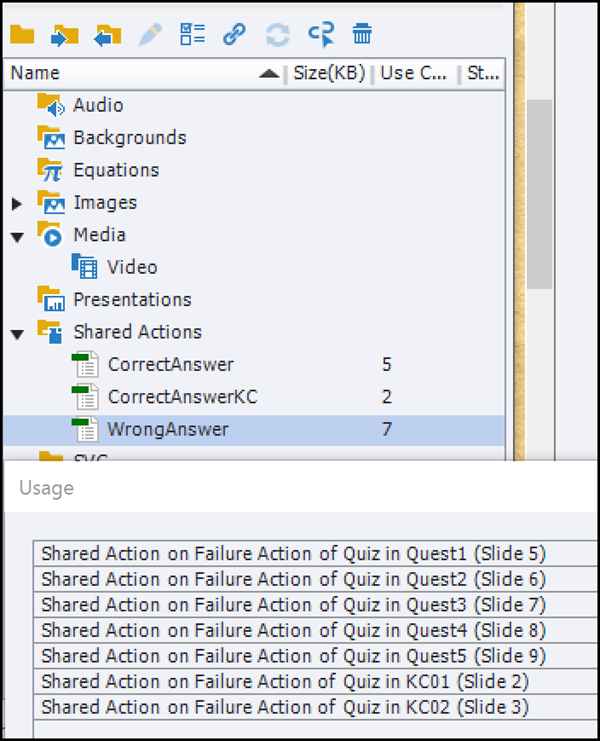 I like the way it is possible to track shared actions in the Library, look at the Usage panel for this action/ You see that this shared action is used both for the two KC slides and for the 5 Quiz slides. I used the CorrectAnswer from Quiz slides as template to add an extra command that will increment the variable v_KC. This is a simple conditional action, to decide if the trophy will show up or not. This conditional action has two decisions. 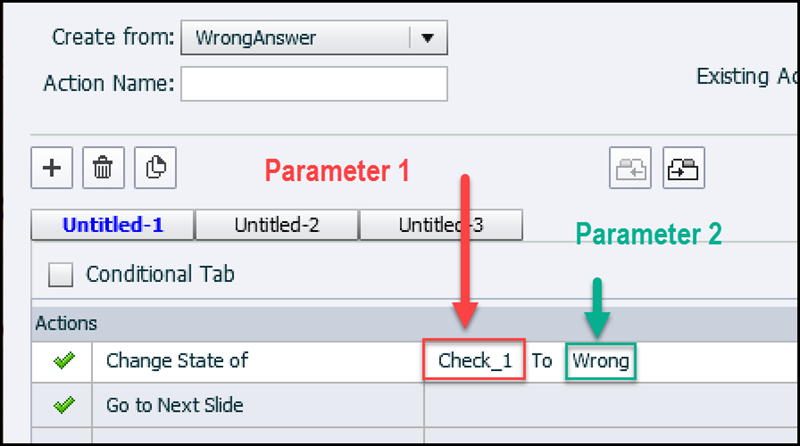 The first decision will change the state of the Retake button to have a Next button if the quiz has been passed or the Quiz attempts are exhausted. The second decision is about showing an image if the quiz has been passed. It also shows or hides the text mentioning the number of the present attempt. This is the 'trick'. 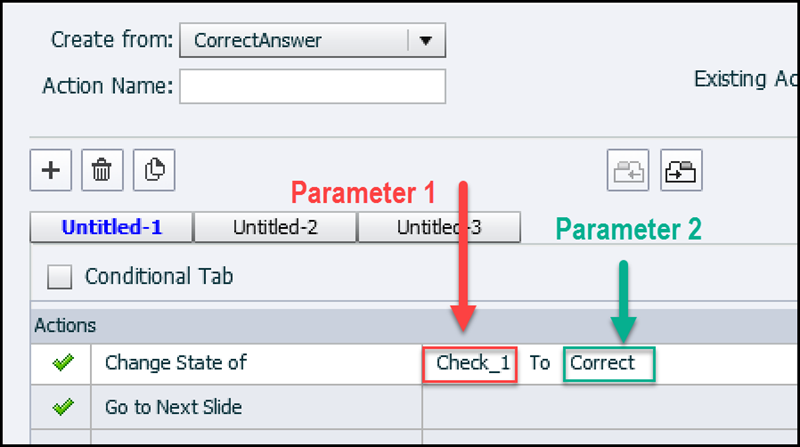 To have the functionality of a Retake button on the previous slide, which is the Review slide, the playhead visits to the score slide, but will immediately jump back to the first question slide. All quizzing system variables are reset in that case. Only when all attempts are exhausted or the learner passed the quiz, will the score slide become visible to the learner. You can have a review side after a chapter which has some question slides or KC slides; in that case you'll have to tweak the advanced actions; if you want to track different bunches of KC slides you can either reuse the variable v_KC or use several variables. 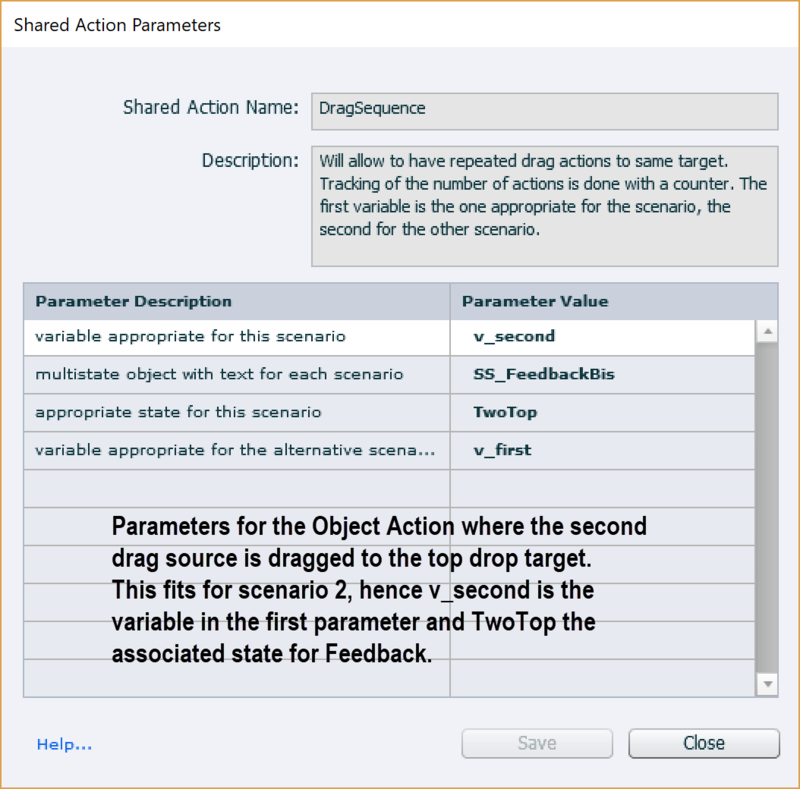 In the last scenario you'll have to turn the variable in the shared action into a real parameter. 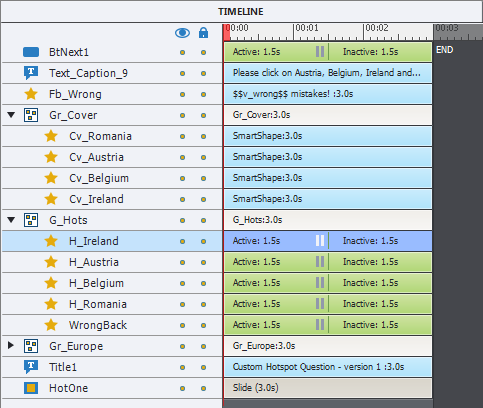 Reusability in Captivate is one of this tool's most amazing features, but a lot of the (often time-saving) possibilities are not well known by (starting) users. When I mention the word 'external library' in a presentation I see a lot of confused eyes among the participants. Even recently, based on an answer on the forums, someone sent me a message: 'What are you talking about, never heard about external libraries in Captivate, where can I find them?'. Time for a short blog post, with some efficiency tips about using the Library. Contrary to the Timeline panel which is hidden in the newbie UI (I consider this a great mistake), the Library panel has a big button on the Big Button Bar in the newbie UI. I'll take you on an overview of that panel. The Help documentation is very concise about Library: https://helpx.adobe.com/captivate/using/captivate-library.html It has a description of the columns in the Library panel, which I will not repeat in this post. Audio: will have all audio clips, whether imported or recorded in Captivate; whenever you edit an existing clip, the original and edit clip will be in this folder. If you import a (compressed)mp3 file it will automatically be converted to a 'raw' wav-file which will also be in this folder. It is recommended whenever possible to import a wav file, when published it will be compressed to mp3 by Captivate. Backgrounds: backgrounds used in project, master slides or created when recording a software simulation. Equations: only for the versions that have MathMagic included (if you see it still in CP2017, which has no longer MathMagic, this is a bug). That folder will store the images created with MathMagic. Images: has all used bitmap images of any format; exception are the images created from layers in an imported Photoshop file. When importing such a file an individual folder will be created (under the root, not under Images), with the same name as the PS-file, and having all the layers converted to PNG images. If you insert Characters (Media button) they will appear in this folder as well. Later on in this article you'll find a screenshot with an imported Photoshop file. 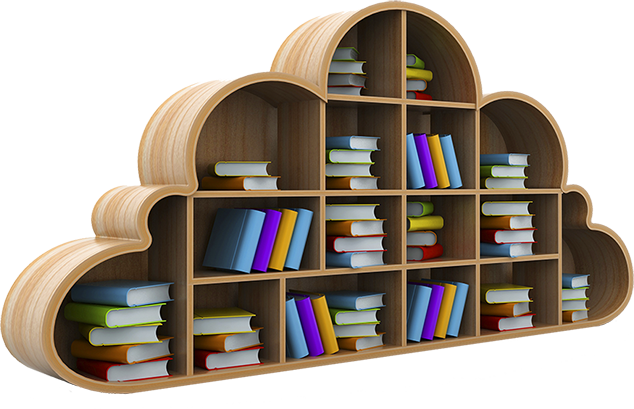 Shared Actions: contrary to advanced actions, shared actions are in their dedicated folder in the Library, and they have all the possibilities offered to all assets. Import: you cannot import folders, but you can select multiple assets to import in one action. They will be placed in the folder for their type. You cannot import layers from a Photoshop file with this button, you need to use the menu File, Import, Photoshop File. Export: it is possible to export a number of assets to one location. Each will get its appropriate extension. If you never used shared actions, know that the extension 'cpaa' will be added for them. Properties: will open a window with asset properties; I almost never use that button but will double-click on the name of the asset (see Properties in the screenshot below). 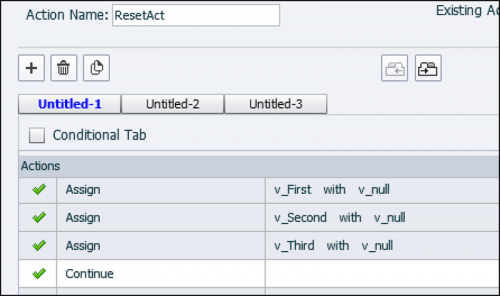 Usage (CTRL-ALT-U): there is a column 'Use Count' as well, but this button opens immediately a list with all the locations where the asset is used. 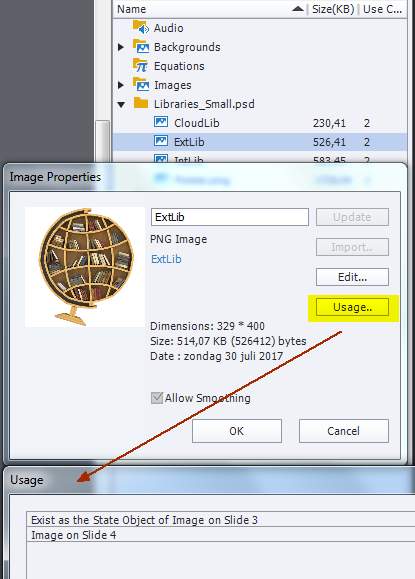 Alternative is option Usage in the right-click menu on the asset, or the Usage button in the Properties window (see screenshot below). In the screenshot you see that Usage counts also images used in object states. Select Unused Items: contrary to what some people 'believe' deleting unused items will only decrease the file size of the raw cptx file, not the file size of the published file. I prefer not deleting unused items until the project is finished. 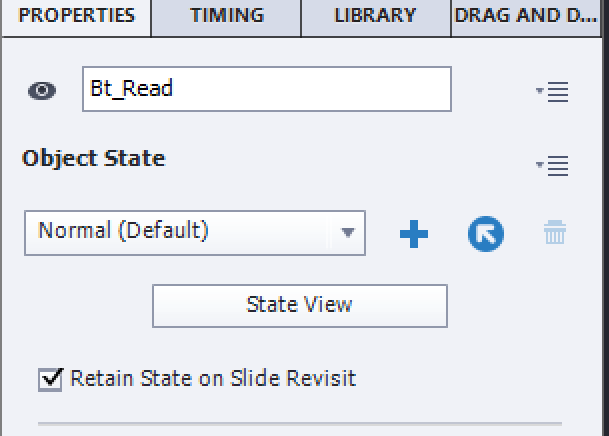 Captivate users tend to insert assets one by one on slides using the Media Button. An alternative way is to import first (all) assets to the Library. From the Library you can drag them to the stage (or to an object). For audio clips, when dragging to the stage you'll have it inserted as slide audio, dragging to an object will create object audio. Same is valid for shared actions: dragging a shared action to the slide will create an On Enter action for the slide, dragging a shared action to an interactive object will create a Success action for that object. Even if you don't use custom folders/subfolders think about labeling assets that got generic names. A relevant example are audio clips generated by TTS. Use the first button in the Control panel of the Library panel (see above) and browse to the project (cptx)where the Library you want to use is stored. Use the menu File, Import, External Library and point to the project (cptx). In the screenshot below you see such a floating External Library to the left of the docked Internal Library. If you are using the Newbie UI you'll not be able to dock that External Library in any docking station (always recommend to switch to Expert UI). 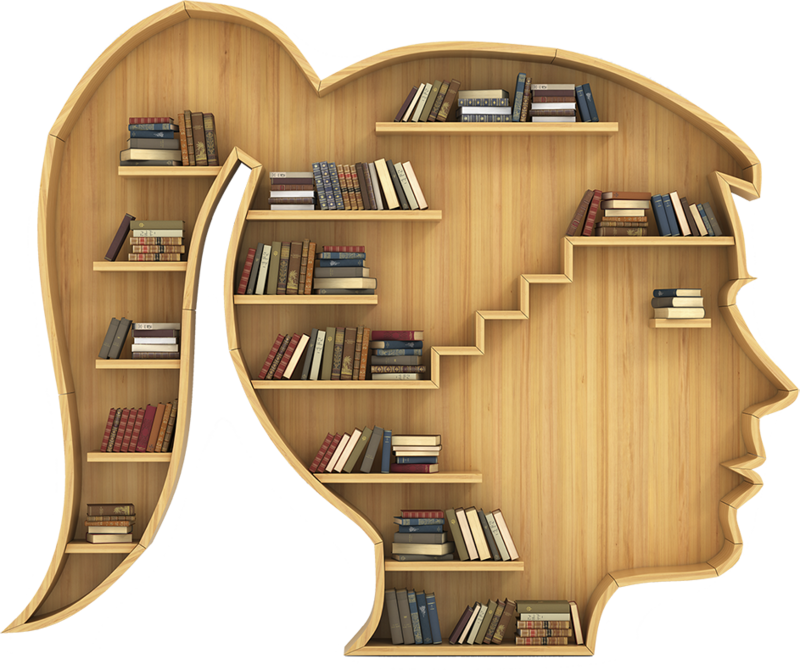 Its layout is totally similar to the Internal Library. 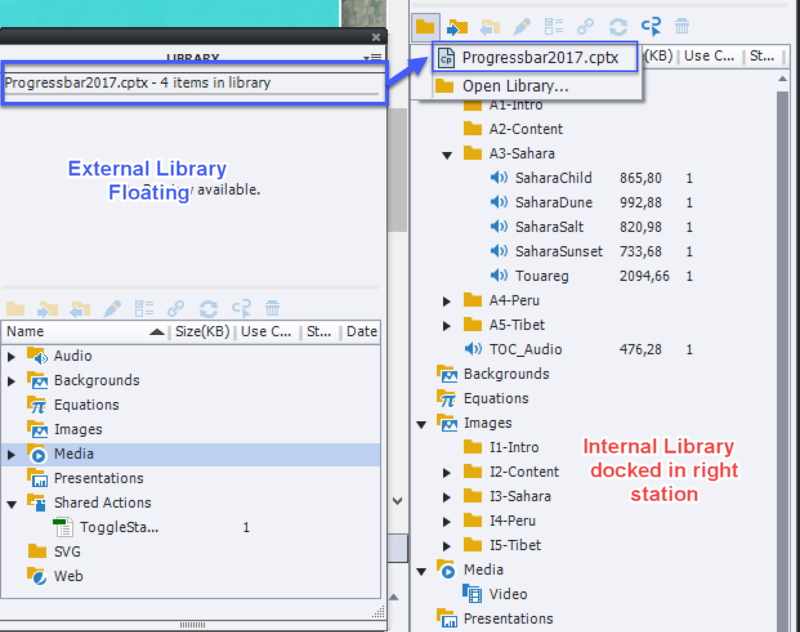 The only way to recognize it as external, is the name of the Captivate file from which it was opened, and the presence of that same name in the dropdown list under Open Library button. If you are not used to floating panels because you are in the Newbie UI, here are some warnings. Do not reset the Classic workspace while an external library is opened, or you'll lose it. External libraries do not appear in the Window menu where you find most of the default panels. Only the internal Library (CTRL-ALT-L) can be switched on/off using that Window menu. You can use an external library (or multiple external libraries) exactly in the same way a the internal library: drag an asset to a slide, or to an object (for audio clips). 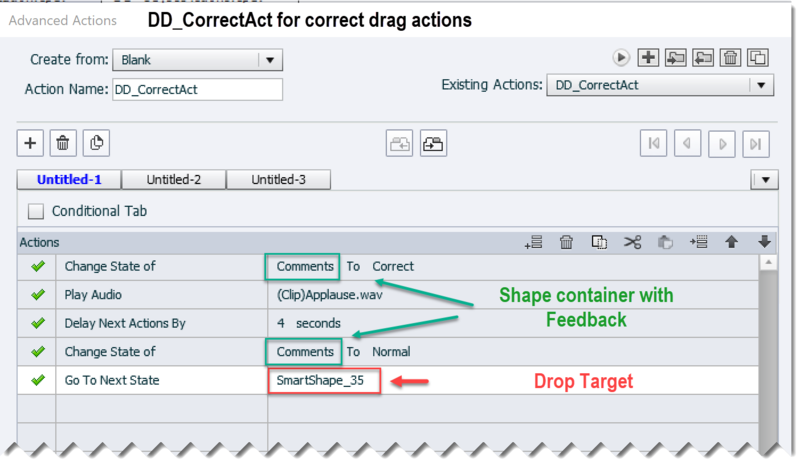 However I will offer one recommendation for Shared actions (see more details in this blog post): I prefer to drag those actions first to the Internal Library, instead of attaching them directly to a slide (On Enter) or an interactive object (Success event). As you probably know, if a shared action is using a variable, this variable will automatically be created when using that action in a new project. To avoid problems with duplicate variables follow the recommendation of that mentioned article. For all the copy/paste lovers: believe me, using assets from an external library is a much safer work flow than copy/paste objects between projects (one of the causes of corruption). 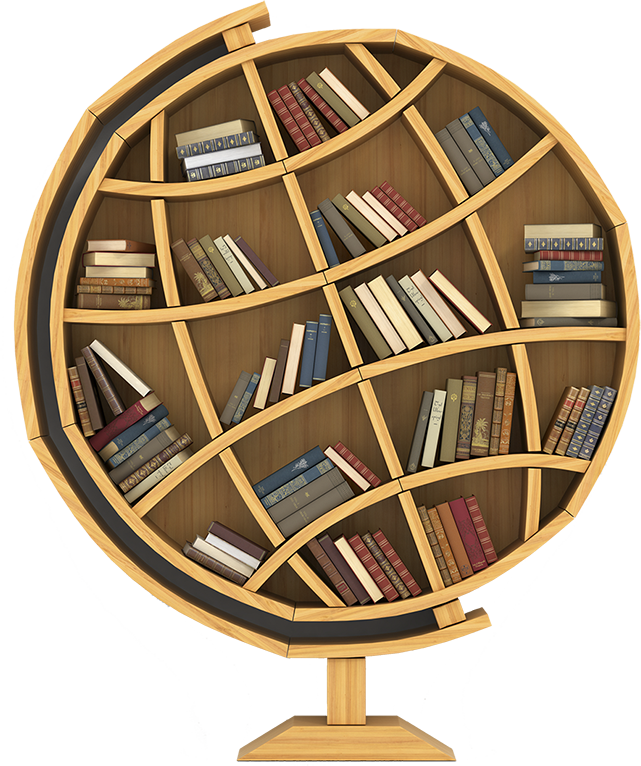 Using external libraries can save time and help to achieve design consistency. For much used shared actions (like the toggle action described in this post) I have a dedicated project ready which I open as External Library in any new project. Images and SVG's, which I use all the time, are stored in another Libarry. I have an external library with sound clips that are useful. If you are a developer in a company, you see the advantage of using external libraries for sure! This last part is 'wishful thinking': if you are a CC user like me, it would be a relief if we got access in Captivate to the CC Libraries. It would make the transfer of assets created with Adobe Color, Photoshop, Audition, Illustrator, Animate, Adobe mobile apps.. so much easier. Same is valid for managing Adobe stock assets, which can be inserted in CP. Captivate Draft has access to the CC Libraries, and could be used as an intermediate player: use it to retrieve custom color palettes, image and other assets. Once the Draft project is exported to Captivate, you'll have them in the Internal Library. But if you don't have an iPad, this work flow is impossible. Same when you don't use Draft for storyboarding but another application. Please, log a feature request to support (one of) my Captivate dream(s)! A couple of weeks ago I presented a session 'Enhance Effectiveness of Quizzes in Captivate 8' at DevLearn 2014. One of the subjects that I barely was able to tackle due to lack of time, is the creation of custom questions. You'll find several blog posts where I created custom questions using standard objects, widgets and learning interactions. On the forums I often suggest to replace the default hotspot questions by custom questions. And finally find the time to explain why I recommend this. The success of the Quiz blog posts and of this BYOL session at DevLearn make me wondering if an e-book with focus on Quizzing would be welcomed by the community? Looking for comments on that plan. Watch this movie. After the intro slide you'll see two Hotspot questions. Both questions have partial scoring. The fourth slide is the default score slide, to show how each correct hotspot is considered to be a question as is the case with all scored objects. To remediate, I added a custom score slide as last slide (use Continue button on the 4th slide). I didn't create a Reset or Retake situation. If you want to replay, refresh the browser window. Good luck! v_wrong: counts the mistakes, is not reset because it will continue to increment on second question, is used on custom score slide. Here you see the timeline of this slide. The correct hotspots, shape buttons, have been duplicated to create the covers that are normal shapes with a texture fill. "Always" is a mimicked standard action, self-explanatory. 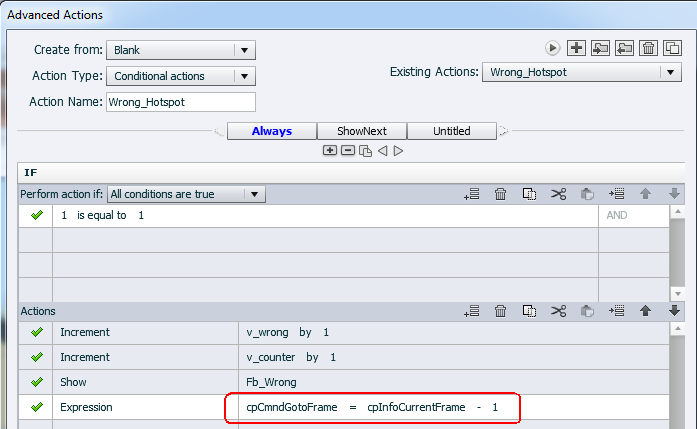 Because this hotspot can be clicked multiple times, the last statement is necessary to place the playhead one frame back, in the active portion of the shape button. 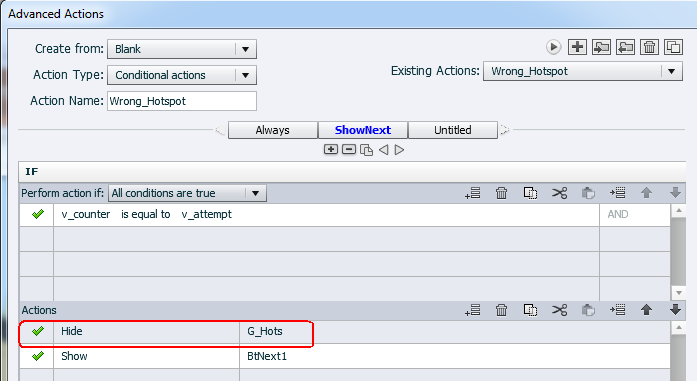 "ShowNext" checks if the number of allowed attempts is reached, and if that is the case will hide all the hotspots and shows the Next button. "Always" is a mimicked standard action, self-explanatory. The parameters are highlighted. 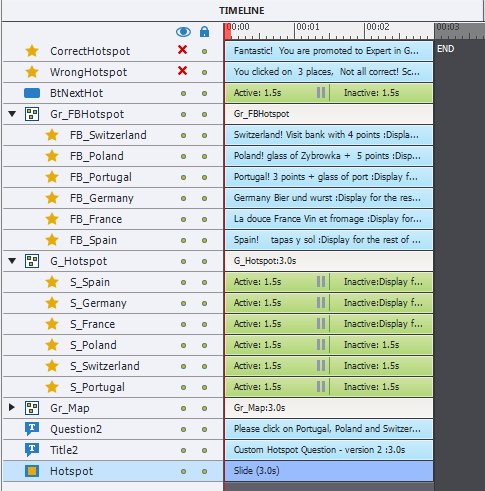 "Checker" is similar to the second decision for the incorrect hotspot. 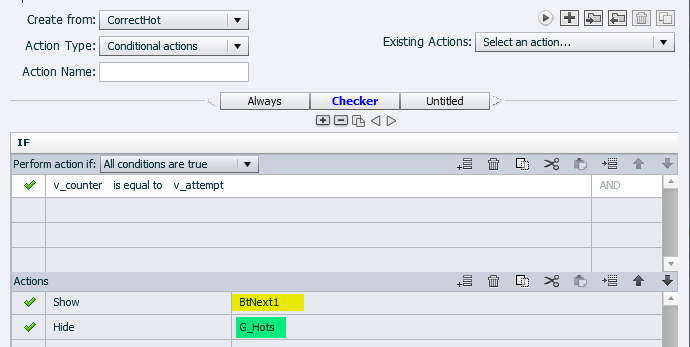 Parameters are highlighted. The On Enter action for this slide is a standard shared action that resets the value of v_counter and v_wrong to 0 and assigns a value to v_attempt. As always I welcome comments about this example. As mentioned in the Intro, I would also like to know if you'd appreciate a book explaining the design, the tweaking possibilities and custom questions for Captivate quizzing.